Debit cards are issued by many different financial institutions, including banks and credit unions. Each of these institutions has its own rules governing whether or not you can use your debit card safely overseas. Before you travel abroad, make sure you will be able to access your funds, either at an automated teller machine (ATM) or a bank in a foreign country, using your United States-issued debit card. Additionally, you should look at safety tips to avoid identity or credit/debit card theft while you are traveling. Always have a backup plan for finances in case you cannot access your funds via your American bank. 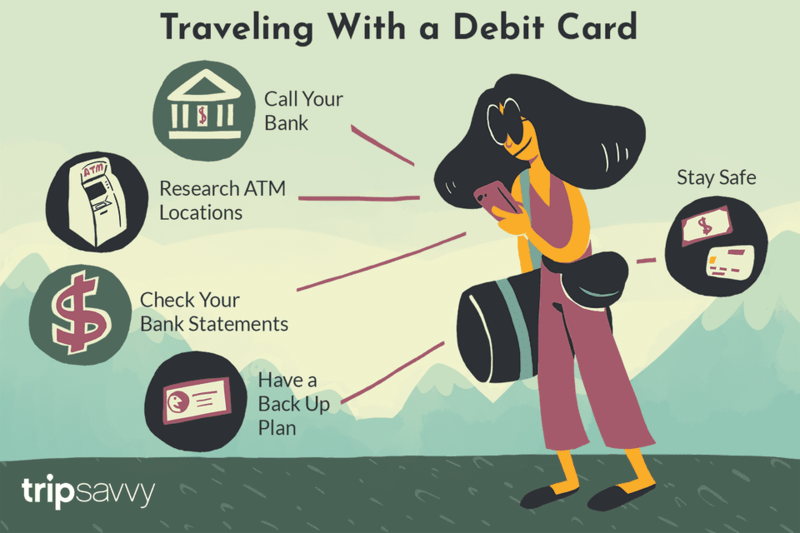 If you follow these simple tips for traveling with an American debit card, you should be able to navigate almost any country without being locked out of accessing your money overseas. Debit cards “talk” with your financial institution via computer networks. Maestro and Cirrus, two of the largest ATM networks, belong to MasterCard, while Visa owns the Plus network. In order to use your debit card in an ATM, the ATM must be compatible with your financial institution's network. You can check which networks you can use by looking at the reverse side of your debit card for ATM network logos. Write down the network names before you travel. Both Visa and MasterCard offer online ATM locators. Use the locators to check the availability of ATMs in the countries you plan to visit. If you cannot find an ATM in your destination cities, you will need to find out about exchanging travelers' checks or cash at local banks, or you will need to bring cash with you and ​carry it in a money belt. At least two months before you plan to travel, call your bank or credit union. Tell the representative that you plan to use your debit card abroad and ask if your Personal Information Number (PIN) will work overseas. Four-digit PINs work in most countries. If your PIN contains zeroes, ask if it will present problems in non-network ATMs. If your PIN has five digits, ask if you can exchange it for a four-digit number, as many foreign ATMs will not recognize a five-digit PIN. Calling ahead will give you plenty of time to obtain and memorize an alternate PIN. During your call, ask about the overseas transaction and currency conversion fees. Compare these fees to those charged by your credit card company. Fees vary widely, so you should be sure you are getting a deal you can live with. Many banks, credit unions, and credit card companies freeze customers’ cards if the cards are used outside of that customer’s normal range of travel. To avoid problems, call your financial institutions the week before you leave. Advise them of all of your destinations and tell them when you plan to return home. Doing this will help you avoid the embarrassment of a declined transaction or frozen credit card. Never travel abroad with only one type of travel money. Bring along a credit card or some traveler's checks in case your ATM card is stolen or fails to work. Carry a list of telephone contact numbers in case you lose your ATM card. You will not be able to dial toll-free or "800" numbers from outside the United States. Your financial institution can give you an alternate telephone number to use when calling from overseas. Leave a list of telephone numbers and credit and debit card numbers with a family member or trusted friend. This person can help you make telephone calls quickly if you misplace your card. Make sure you have enough money in your account to cover your trip expenses, and then some. Running out of cash overseas is every traveler’s nightmare. Since many overseas ATMs have daily withdrawal limits which may not match those imposed by your financial institution, you should plan ahead in case you encounter lower withdrawal limits on your trip. To minimize risk, make as few trips as possible to ATMs. Memorize your PIN, and never write it down in an obvious place. Always carry your cash in a concealed money belt and keep your ATM and credit cards with your cash. Avoid using ATMs at night, if possible, especially if you are alone, and watch someone else use the ATM successfully before you insert your card. Criminals can insert a plastic sleeve into an ATM’s card slot, capture your card, and watch you type in your PIN. When your card gets stuck, they can retrieve it and withdraw cash using your PIN. If you see another customer withdraw cash from an ATM, that machine is probably safe to use. As you travel, tuck ATM and transaction receipts into an envelope so you can bring them home in your carry-on bag. Save your airline boarding pass to prove your return date. If you need to dispute a transaction, sending a copy of your receipt will speed up the resolution process. After you return home, carefully examine your bank statements and continue to do so for several months. Identity theft is a fact of life, and it is not confined to your home country. If you notice any unusual charges on your statement, tell your financial institution right away so they can resolve the issue before someone overseas burns through your hard-earned cash.